At times when pop charts on radio were an impossibility, "Poporama" became the spiracle for a generation of pop fans who wanted to hear the hits of the day in one and only one radio program. The show "Poporama" was their relief giving them everything they ever dreamed of. Stefan Heiding had done some amazing work dusting off all those old radio files containing the show playlists. With the result of this book. Skim through the pages, read and discover! Do you remember what the song "Swing Your Daddy" by Jim Gilstrap sounded like? Was Lene Lovich's "Lucky Number" really as good as you think it was? 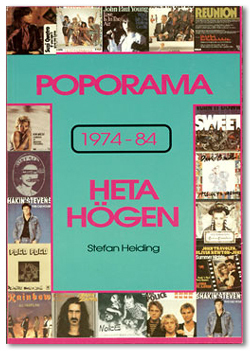 This reference book was composed in corporation with the national Swedish radio.